Okay, this is a little late considering the list of accepted proposals was published on Tuesday (Monday for some), but I've been a little busy with Uni work lately. "...create a completely asynchronous modular and extensible system that enriches messages before they’re displayed to the user. These includes embedding images and videos from links, Translating messages, (re)-formatting them nicely, reading out loud etc." Let me go into a bit of detail on what that actually means. Let's take for example the the Image plugin in Kopete: when a user sends a link to an image it downloads downloads, scales and embeds the image directly in the chat window. Before my friends found out about this and abused it (and even afterwards when they eventually got bored of it), this was a very useful plugin. It made the conversation much more interesting to look at (instead of being a dull wall of text and timestamps), and it meant that most times I didn't have to actually click on it and open a browser to see what they meant. And a another screenshot here. I apologize for all the memes, but they're the only 2 screenshots I have of it and I honestly don't have the time to search through all the branches in all the clone/scratch repos to look for that code again. But suffice to say, it had a few drawbacks like the fact that you couldn't disable them. And the code consisted mostly of a hack, so it clearly wasn't in a state to ship. Rather than keeping it in a branch and rebase-ing after every update so it stays just for me, I thought I may as well do this properly and make something useful for everyone. Thus the idea of a plugin based Message Filter system was born. I noticed that there were quite a few things that would be useful for a text-ui to do besides just embed images. A lot of clients like gtalk and facebook do embed things to make their chat more interesting for people. 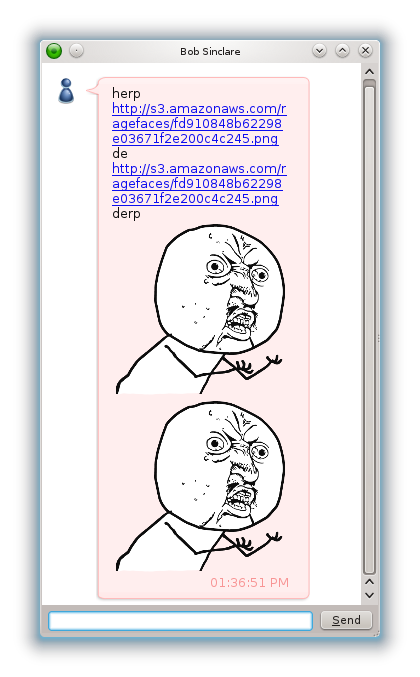 Description - Embed title and image (like facebook and google+ does when sharing) of an any incoming link. Mailto - Replace email addresses in messages with appropriate mailto: links. Search Commands - replaces commands like ‘lmgtfy:dbus tubes’ with ‘http://lmgtfy.com/?q=dbus+tubes’ before sending. Right, I have some stuff working so far, which I'll blog about later. So hopefully by the end of this project your chat window would be much more 'enriched'. PS: Feel free to suggest some relatively easy that could be added to that list. (On the off chance that I might finish early). I... simply can't wait. If implemented properly this could really be the killer feature of KDE Telepathy. + I hear that the guy mentoring you is really awesome. These are BIG BOY features! can't wait. OTR would fit well into "Enhanced Display"... ? OTR cannot be done at a UI level, it should to be done at a telepathy transport level. (i.e in Telepathy itself not KDE-Telepathy).